The Awards ceremony took place in Durban – South Africa on 6th October 2018 in front of over 400 Africa’s Tourism leaders, lodges and safari companies. 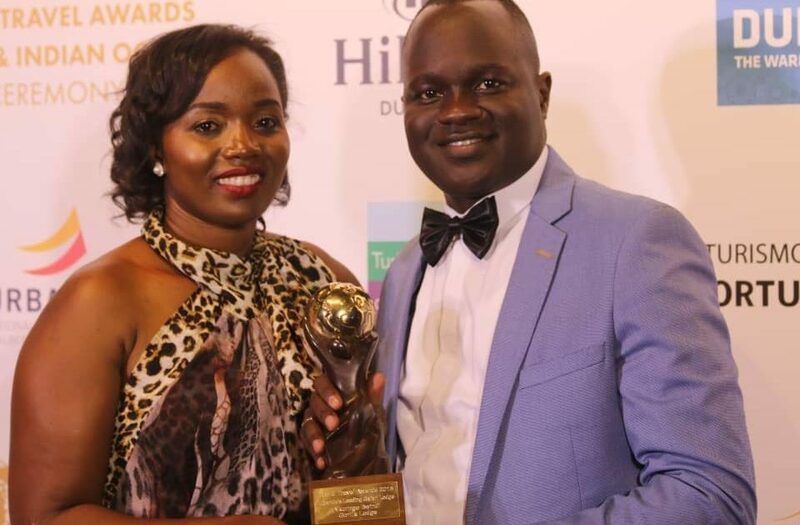 After winning the award,the Proprietor of Nkurigo Bwindi Gorilla Safari Lodge Mrs. Lydia Nandudu Golooba said; “Its a great privilege to be recognized as the winner in our field and to be accorded this prestigious prize. We pride ourselves on providing authentic Safari experiences to our clients, providing customized superior service and bench-marking as well as competing on the Global stage. Mrs. Golooba further added; “We started the lodge with my partner in 2007 as a community campsite with only one Gorilla family on the southern Sector of Bwindi impenetrable Forest. Ours is a story of perseverance, humble beginnings as the chances of running a business with only 2 two Gorilla permits open for the public with the other 6 attached to upmarket lodges seemed like swimming against the tide. In order to create a competitive business edge, we started the Nkuringo Walking Safaris in November of 2007; We now focus on walking clients from Kisoro town with canoe excursion on Lake Mutunda to allow them to spend 1 night in Nkuringo and the next day walk to Buhoma where they see Gorillas. The walking safari pioneered by Late Robert Brierley, became a sought after activity, allowing clients to experience the ‘off the beaten track’ Uganda on ‘foot’. Subsequently more clients needed accommodation and this led to the development of Nkuringo Gorilla Camp that has organically grown to what is now the “Nkuringo Bwindi Gorilla Lodge” a 3 times award winning lodge.